It's no longer a secret! Our little community in southern Hillsborough County continues to grow and thrive! SouthShore is now the place to be in Hillsborough County! With Amazon Fulfillment Center, Gateway Classic Cars, St Joseph's Hospital-South, Gannon University and the YMCA all landing right here in SouthShore over the last year, we continue to watch our community transform from a sleepy little town with potential to a place filled with opportunity, options and promise! SouthShore offers a community college, a postgraduate university, two large hospitals, arts and cultural venues, residential communities and tourism destinations. With three major roadways - U.S. 41, Interstate 75 and U.S 301 - running through SouthShore's central location, we offer close proximity to Tampa, St Petersburg, Sarasota and Orlando. The community is home to the beautiful Alafia and Little Manatee Rivers, both of which flow directly into Tampa Bay. We are an ultimate ecotourism destination with so many treasures to discover. Daily sunsets, waterside dining, seasonal manatee visits and beautiful nature preserves are just some of the unique opportunities we have available for residents and visitors to enjoy. The SouthShore Chamber of Commerce is an organization that works together with our businesses, residents, nonprofit organizations, schools and county government to grow the area while maintaining its special quality of life. We are constantly finding unique ways to positively impact the area and our member businesses. With our directory, we have started to uncover some of our most precious "hidden gems." Many have ventured out and started to discover SouthShore. 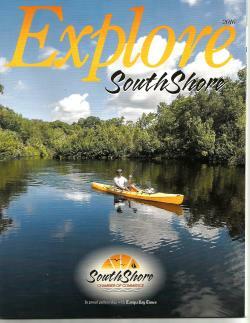 We hope each edition of the directory will help you get even better acquainted with all SouthShore has to offer. We are always proud to be part of the community, and we are certain you will continue to be impressed. We have featured a different slate of Remarkable Residents for you to meet, and, hopefully, it will help you to get an idea of the kinds of people we have calling SouthShore home. We invite you to continue to EXPLORE SOUTHSHORE!